Naturally, every up and coming music act would happily exploit the opportunity if mistaken for the in-law of an A-list artiste such as Davido. But this is not the case with budding afro-pop artiste, Omeje Chidiebere David, aka Chidokeyz, who is rumored to be Chioma’s brother, Davido’s girlfriend. 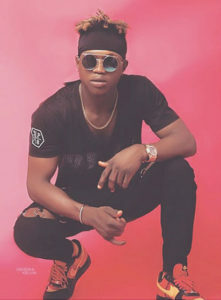 In a chat with Showtime, Chidokeyz who recently released a song titled ‘With You’, featuring Davido, said he shares no blood relations with Chioma, Davido’s celebrated girlfriend. “I woke up one evening to see that I was tagged on a post which had gone viral in less than 10 minutes saying I’m Chioma’s brother. I had to push for the news to be taken down because personally I don’t know the origin of the news till now. But as far as I know we are not related by blood”, he said. Speaking on how he met Davido he said; “I actually met Davido through a friend that is like family to him. I met this friend sometime last year during one of my movements. After listening to my songs he told me he thinks Davido will like my style of music so I should come through for him to listen to my songs. After a long while I finally met Davido through the same guy at a fun spot in Lekki from which we went to his house. He listened to my songs and decided to have a recording session with me and that was it”, he said. Speaking further, he said contrary to public belief, he has no intentions to ride on Davido’s influence to stardom. He said, “I’m praying for stardom but not trying to exploit anyone’s fame, I believe in what I do, I believe in my sound and I trust the process, surely stardom will come but no one knows when.